Club Caron Dance Party a Huge Success! CGOA members danced the night away at the Club Caron dance party. Special thanks to Caron for sponsoring the food and cash bar, to Doris Chan for her DJ services and sound system, and Crochetville for licensing the music. Pictures will soon be posted all over the internet by a number of CGOA members to show everyone how much fun we had! If you enjoyed the event and would like us to continue next year, please let us know. If you had as good a time as the organizers did, we hope to do this again next year! All photos copyright 2010 Doris Chan. Used with permission. All rights reserved. Child’s Japanese Kimono inspired coat in orange, brown and pink wool with a crazy quilt style sash and delicate ruffled skirt. Dress took four and a half months to complete. 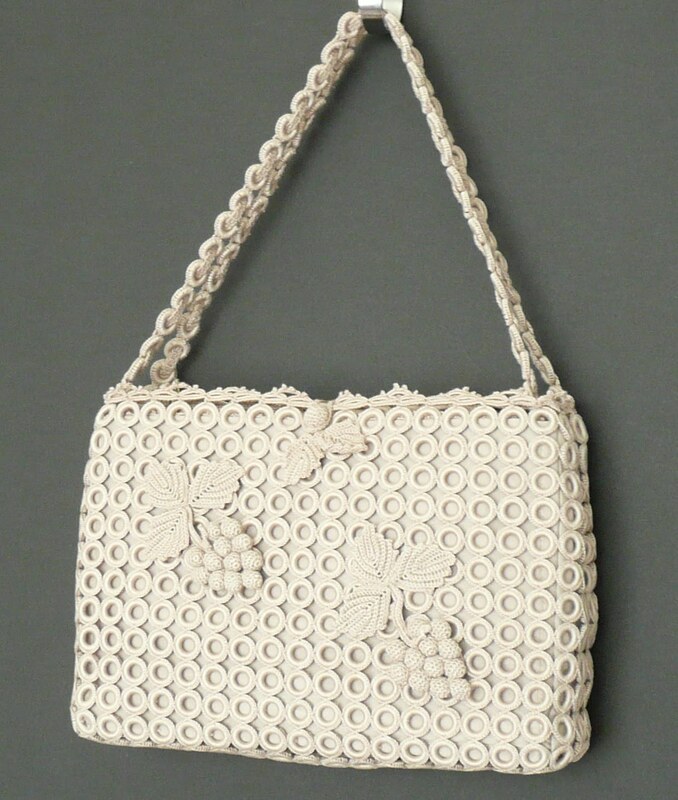 100 percent Japanese silk was used for the design which was worked using various stitches into the modern take of Irish Crochet. Buttons are all hand made, done with glass beads. The dress is a combination of Caron Country merino will blend with Red Heart acrylic and the neckline is made with Nashua Grand Opera (wool, viscose, metallic, polyester) yarns. 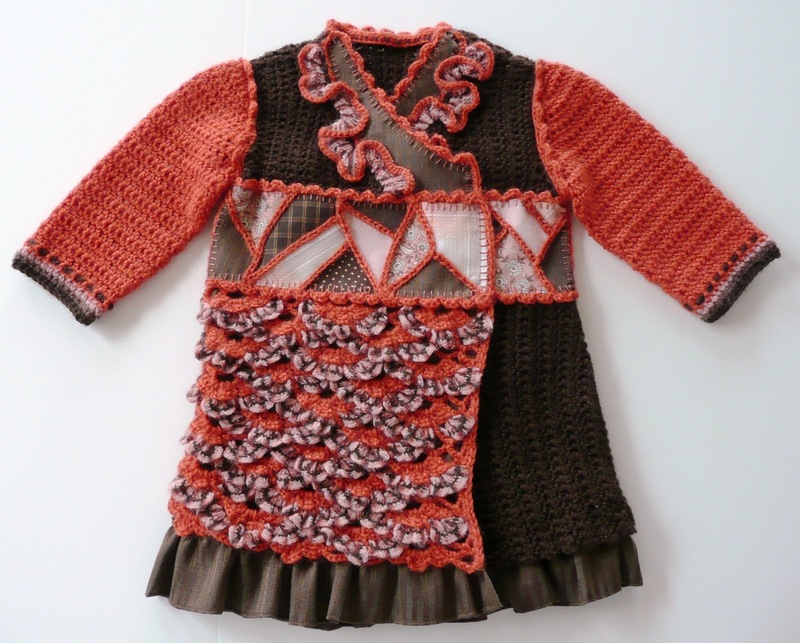 The dress uses tapestry crochet to show the city skyline at the bottom and the top is made with various designs using single and tapestry crochet. When I think of this stole, I remember the first time I wore it. It was a special night, breezy and cool, and I felt beautiful. 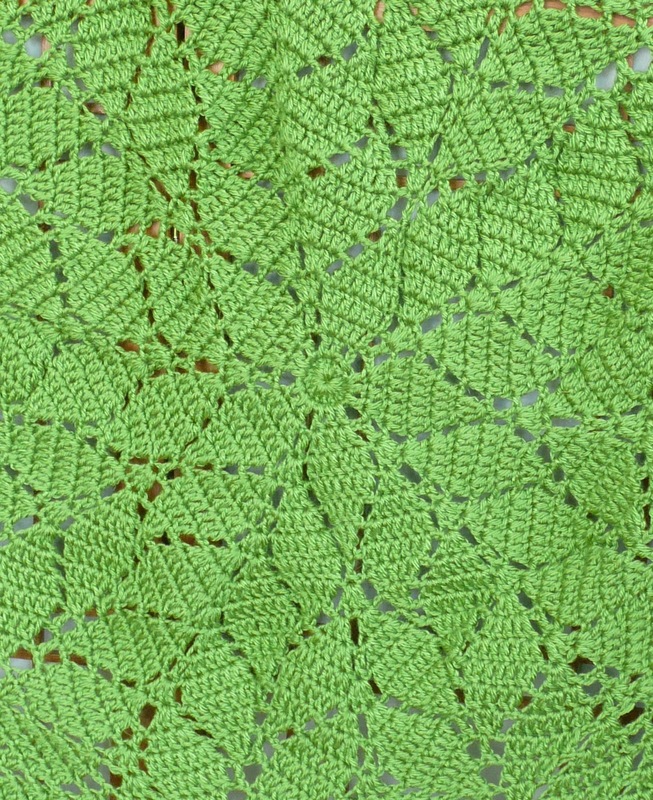 The Tunisian stitch pattern is my own combination of eyelet, slip, and twisted Tunisian stitches. 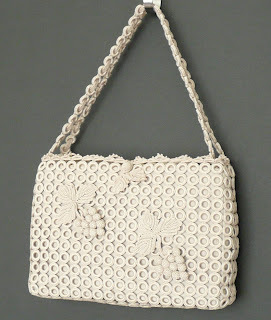 I have not found this kind of eyelet lace used anywhere else so I've named it “Wicker Stitch". I like that the return rows settle into enough of a diagonal grain that the fabric acquires more stretch than the usual Tunisian stitch pattern. Yarn is a 75% kid mohair and 25% silk lightweight yarn called Ovation by S.R. Kertzer. 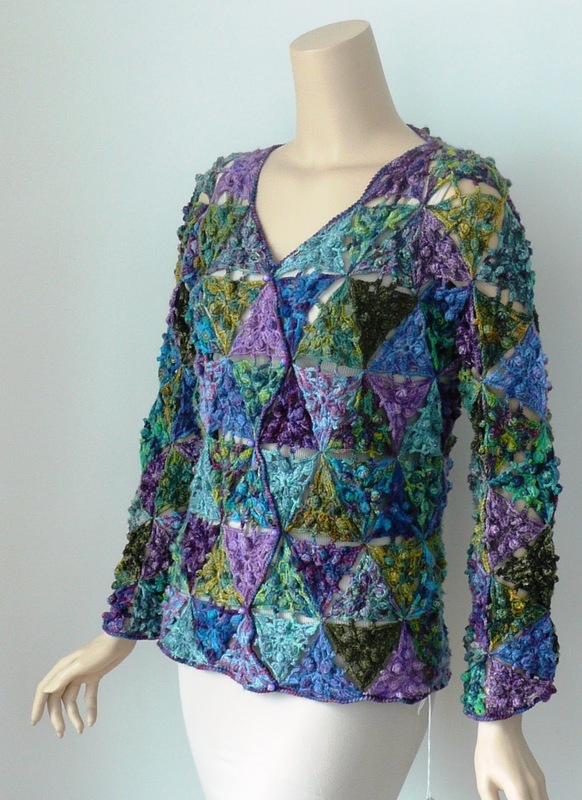 Colorful triangular motifs were used to build this design. Part of the fun is selecting several colorways and arranging the colors as you go. A clever crochet trim worked down the front of the sweater simulates a cardigan style, with beads added as faux buttons to complete the look. Short sleeve fun cardigan in a specialty rayon yarn in vibrant colors. Some free form embellishments spice it up. While not really special occasion, it can go from day into evening. The yarn inspired this design. 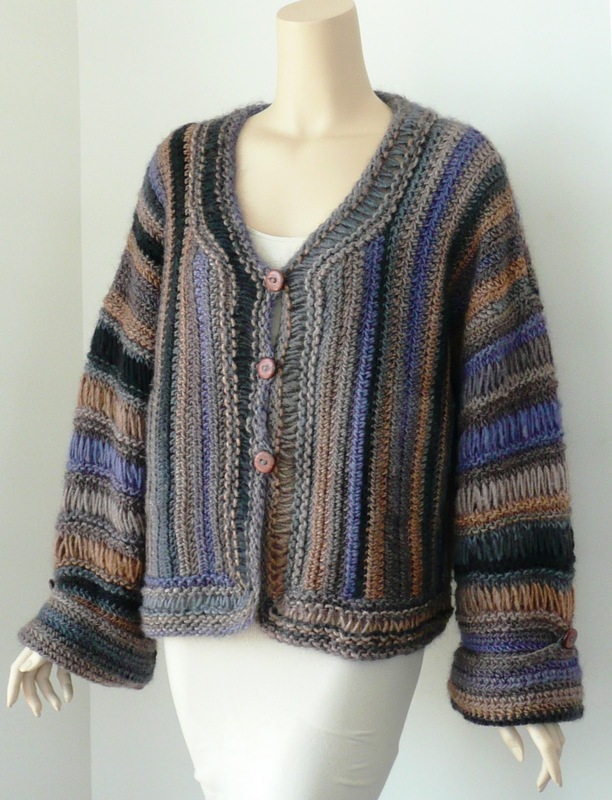 This mixed media cardigan was my response to a terrible woman who announced (in a knit design class) that crochet was only good for TRIM. So this cardigan has KNITTED trim. With pockets. The bright primary colors and thick felted texture make this an ideal "floor play" mat or playpen mat. 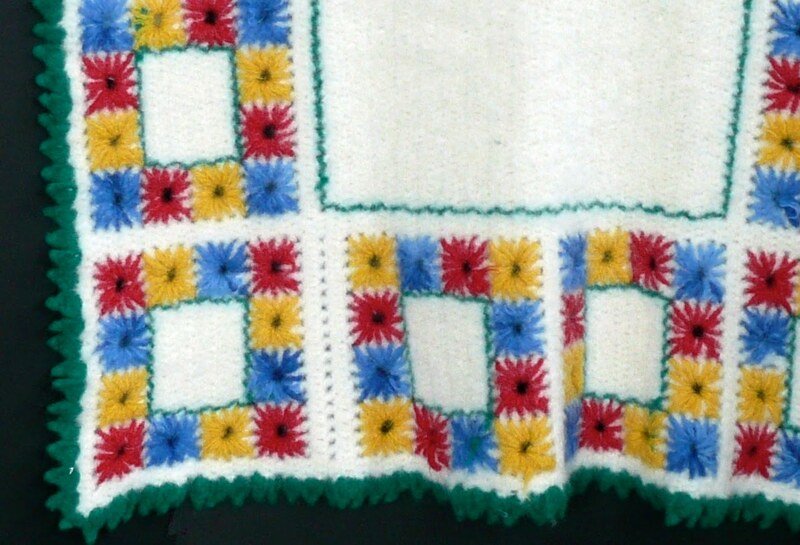 The blanket is crocheted from a filet chart, then flowers embroidered with wool yarn and then it is all felted together. 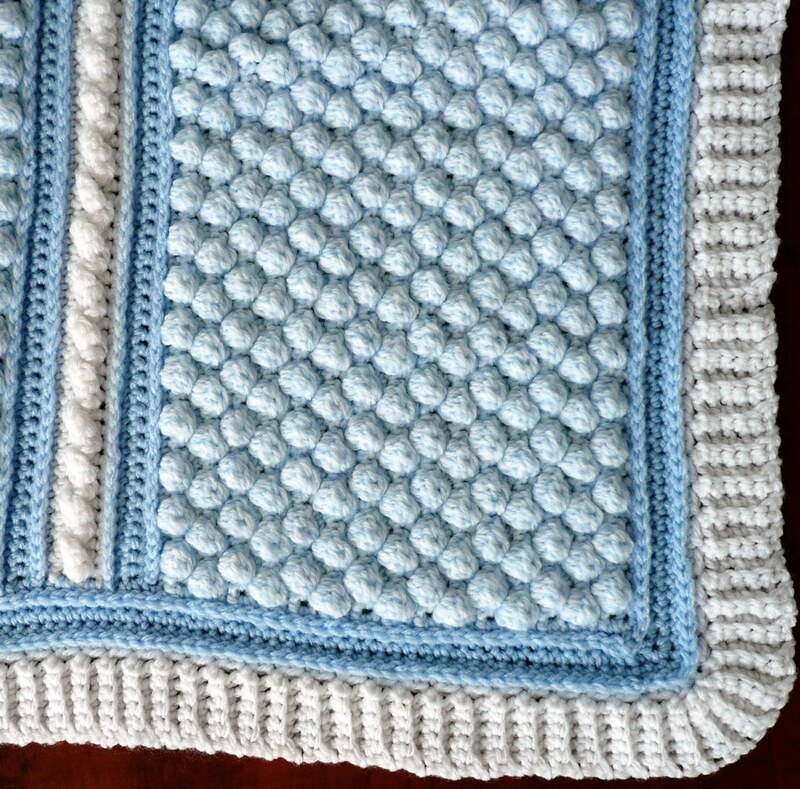 Pre-shrunk by the felting, the blanket is machine wash-and-dryable... easy on Mon, fun and safe for baby. 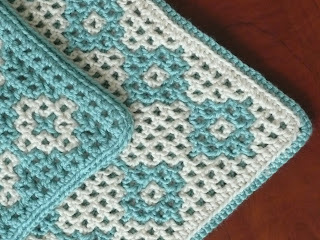 This baby blanket is created in Coats&Clark Red Heart Soft yarn in Seafoam and Off-White using Interlocking Crochet Antique Brooch stitches. One side has seafoam background with off-white antique brooches; the other side has an off-white background with seafoam antique brooches. Tanis Galik's book Interlocking Crochet will be out this November. It contains 10 single-design stitches and 70 double-design stitches, plus 10 new Interlocking Crochet projects. 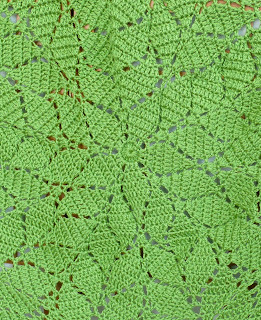 Tanis can be reached at www.InterlockingCrochet.com. 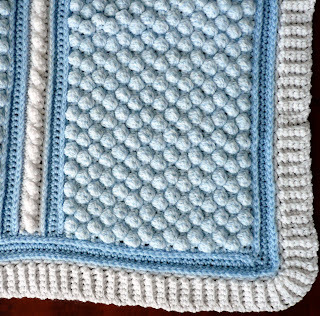 The throw was done in Bernat Baby Sport: Baby White, Baby Denim Marl and Baby Blue. The bubbles were created by using a sc cluster and cables used to accentuate the throw. A freeform crochet necklace inspired by shells found on the beach in Kuwait. 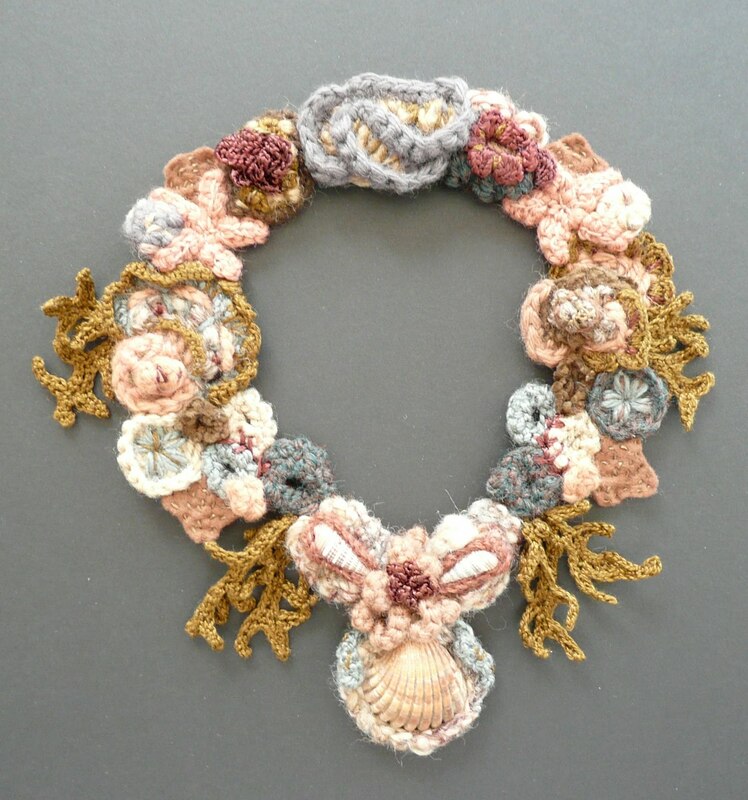 Scrumbles and felt cut-outs are embellished with embroidery and arranged to showcase the seashells. The Tree Hat is a one of a kind piece created for the 2010 International Freeform Crochet Guild's online show and book, "Somewhere in My World". Yarns used: Patons Classic Wool and Berrocco's Softtwist and some minor amounts of metallic/mohair yarn. 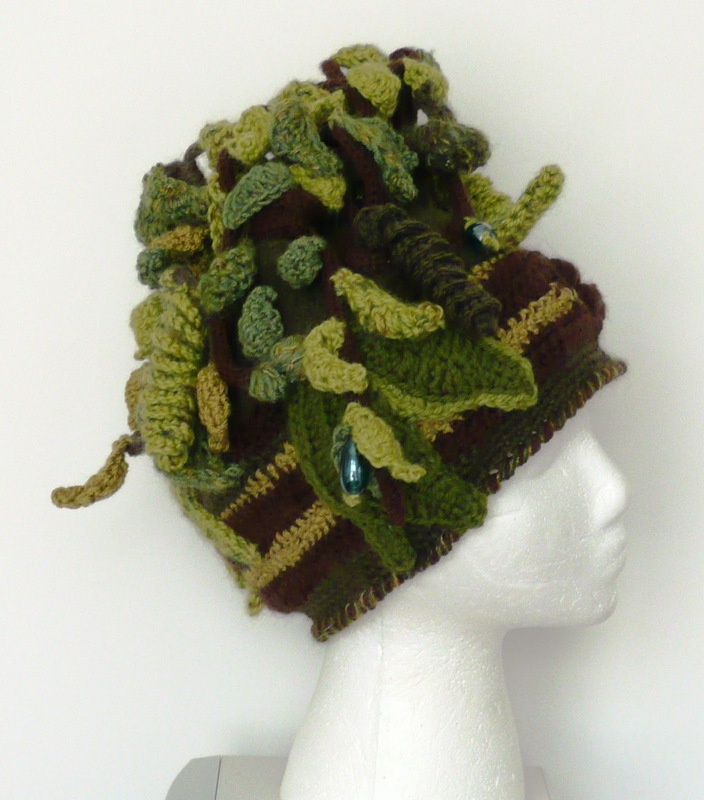 Hat is primarily crochet except for the "tree limbs" which were made using pipe cleaners inserted in knitted I cords. Top of hat started with a crochet piece with "tree trunks" that was then felted. Landscape crochet using various colors and stitches were added to form the body of the hat with a reverse sc edging. "Tree Limbs" were then inserted in felted "tree trunks"; various size leaves were then sewn to the "tree limbs". Some crochet corkscrews and a couple of vintage lucite teardrop beads were added. Stitches used, sc, hdc, dc, bobble and some surface crochet. Various size hooks used. 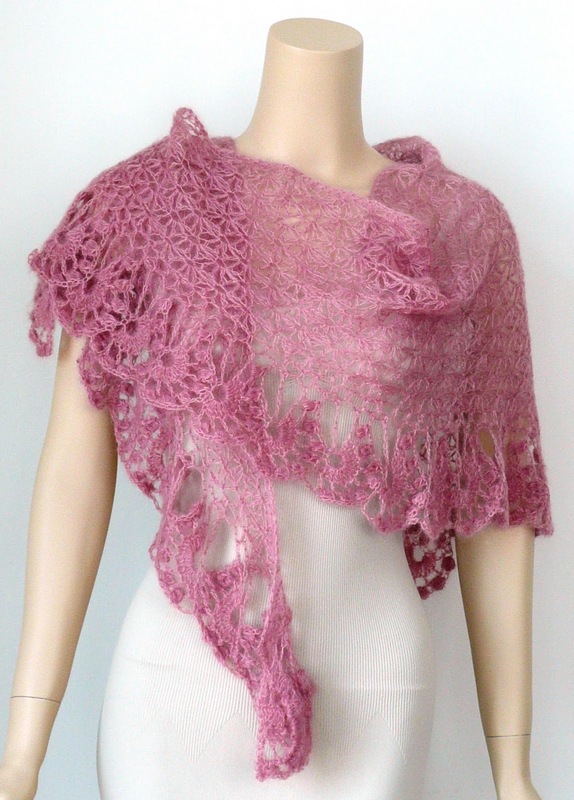 Light and airy Mohair/silk blend, and shoulder warming shape make this a perfect accessory for spring evenings. Peony blossoms decorate the edge, adding elegance. 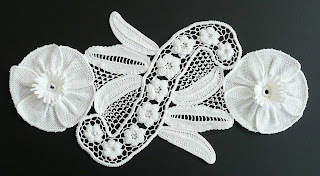 This piece was created using a modern sensibility along with a combination of traditional filet crochet techniques and the archetypal look of the grand creations from the past. The pattern is very organic in its construction as each stitch is determined by the stitch it is building upon in the row below using the "if, then" logic process. These techniques from the past and modern interpretations of the traditional art of crochet merge to create this gorgeously patterned heirloom afghan. This afghan is worked from the center out, and the logic process used in the patterning ensures the smooth lay of the piece. 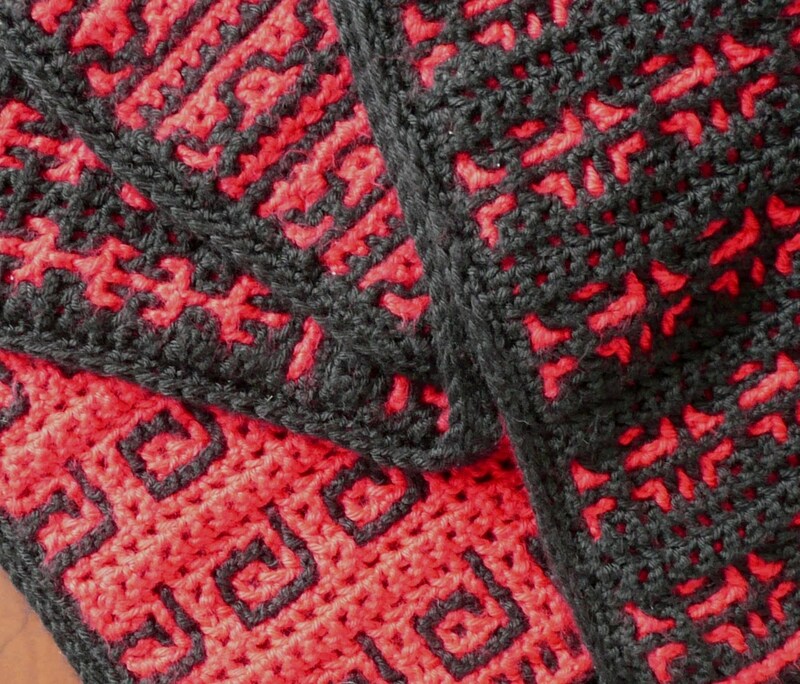 Ten colors of Red Heart Supersaver were used for this afghan. 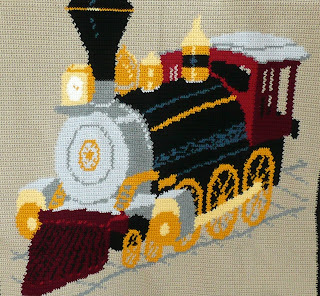 It was made in intarsia method of color changes and is worked entirely in sc stitches. 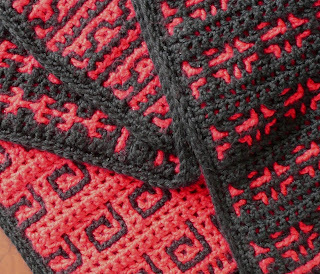 This afghan is created in black and red acrylic yarn using numerous Interlocking Crochet stitches. One side has a predominately black background with four designs in red; the other side has a predominately red background with four different designs in black. Tanis Galik's book Interlocking Crochet will be out this November. 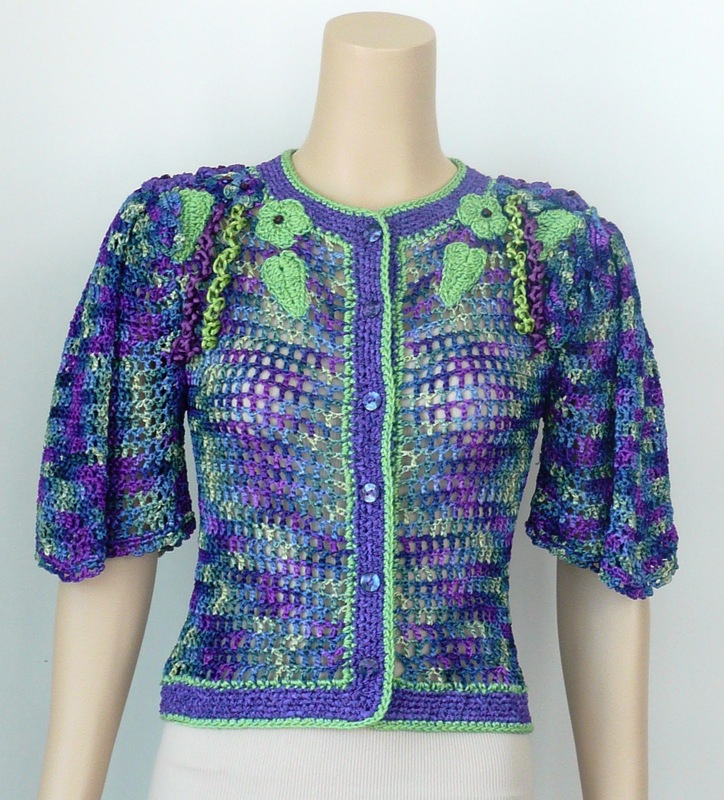 It contains 10 single-design stitches and 70 double-design stitches, plus 10 new Interlocking Crochet projects. Tanis can be reached at www.InterlockingCrochet.com. Evening bag worked in No/ 40 DMC crochet thread with steel hook. 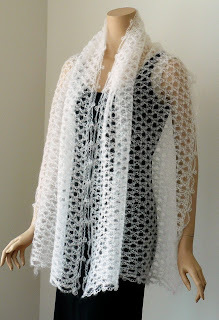 Approx 600 plastic rings incorporated into the design and each ring covered with single crochet as the work progressed. Grape and Vine leaf motifs in traditional Irish crochet technique. The Victorian Tea Gown consists of a beaded bodice with leg-of-mutton sleeves and a laced back. The gathered skirt features a scalloped lace design on the front panel and hem. 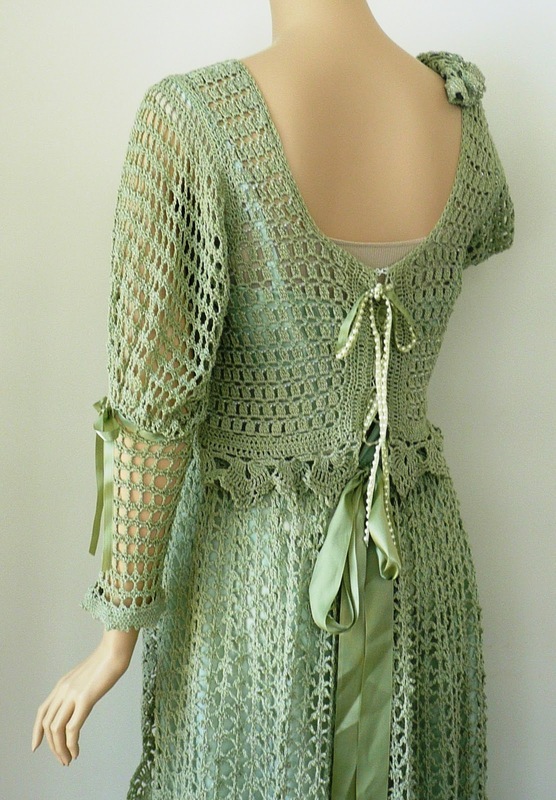 Both pieces are heavily beaded and made with a light green cotton thread. 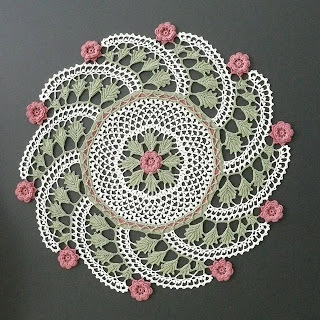 Doily done in size 20 thread in cream, pink and green. 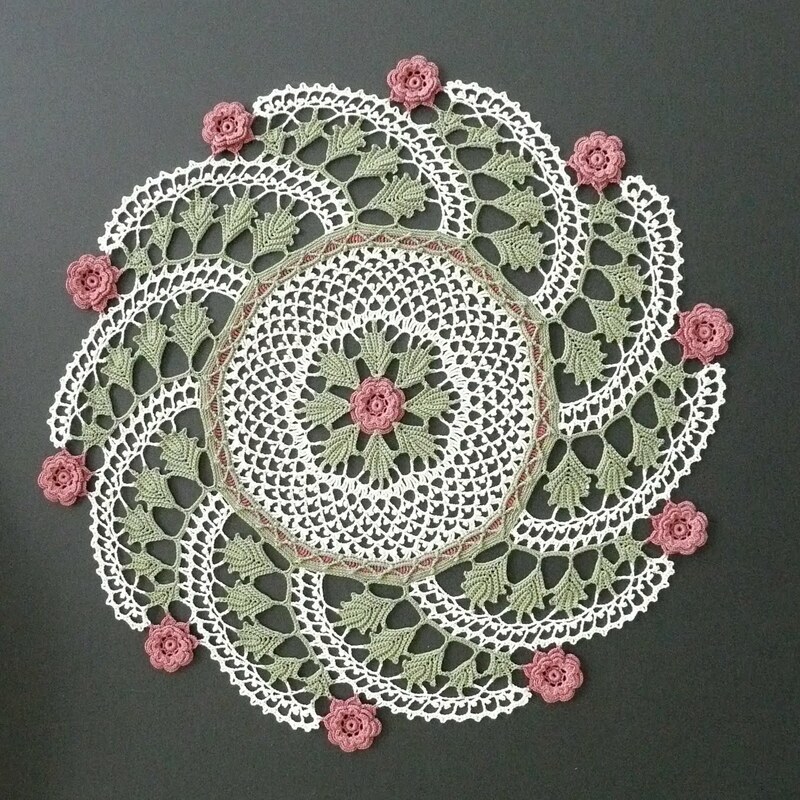 Design has a spiral effect and measures about 18 inches across. 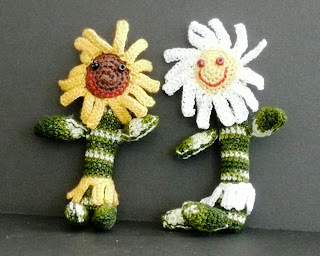 This is my idea of what flowers would look like if they were alive and looked like people. Daisy appeared in my mind fully formed. I knew I had to bring her to life. So this is my vision of what I saw in my mind. I also had to make her a friend so Black Eyed Susan was born. Susan is my favorite summer flower. Contemporary table centre worked in traditional Irish technique, using Coats Patons no/ 100 thread and no/ 10 for padding. 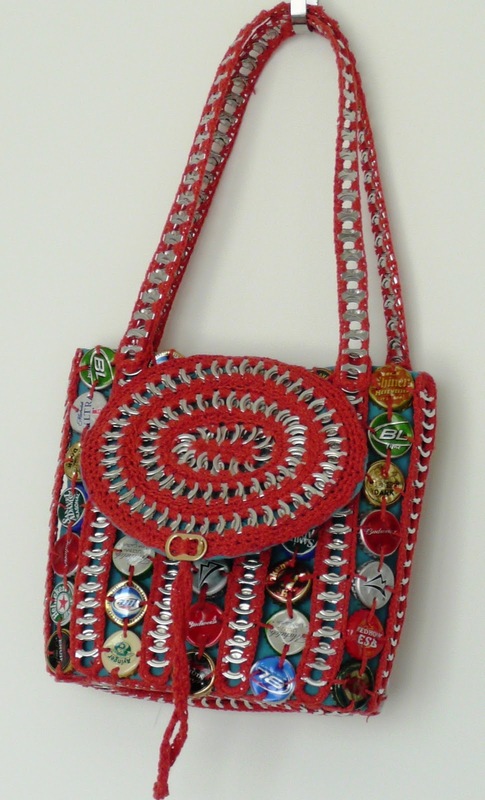 Purse is made from pop tops, bottle tops, corn yarn and recycled fabric. The Free Spirit Tote will quickly become one of your favorite projects. 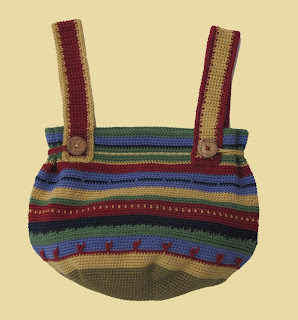 The majority of the bag is done in single crochet with variations such as slip stitch embroidery, back loop only stitches, and frequent color changes to make it anything but boring. The Free Spirit Tote is nice and roomy, with button loops that go around the sides of the top to cinch in the opening and keep contents secure. Pattern is available for purchase at www.PoetryinYarn.com. Over 100 people attended Professional Development Day at the 2010 Chain Link conference. 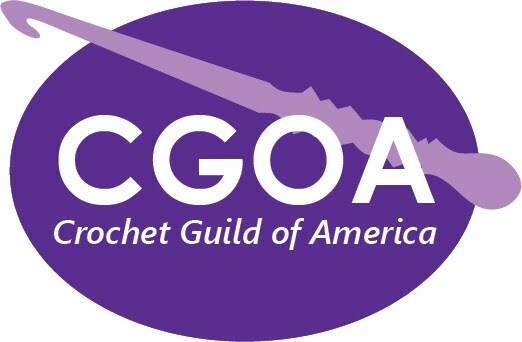 The morning started as Kristin Omdahl shared a look at her daily life as a crochet designer and Lily Chin shared details of her daily life as a crochet instructor. Jack Blumenthal and other staff members shared information about the Lion Brand Studio and the latest Lion Brand yarns. All photos copyright 2010 Amy Shelton, Crochetville LLC. All rights reserved. The day also featured a benefit to raise money for the Lyme Disease Association in honor of Tammy Hildebrand. 2010 Design Competition: Winners Announced This Week! Who will win? In less than a week the CGOA 2010 Design Competition will be underway at the Chain Link Conference in Manchester, New Hampshire. Judges Bobbie Matela of Coats & Clark, Jean Leinhauser of Creative Partners and Edie Eckman, noted author, designer and educator, will be choosing the best of the best from among a brilliant field of entries. Immediately following the Gala Awards Ceremony on Thursday evening, 8th July, a complete list of winners will be posted here. So check back and spread the word.